Upgrade your residential or commercial property with professional polishing services. Unlike some metals and woods, natural stone surfaces require a careful and detailed polishing process. Concrete & Marble Transformers offers diamond polishing using a very fine-grit diamond and water combination that produces an incredible polish. Depending on the stone, we finish with polishing powders, pastes, or diamond pads. These pastes and powders are very abrasive and acidic, and they can have great results when used correctly! Produces a polish that will make your surfaces look brand new! Remember, achieving professional polishing results takes experience and knowledge. If you have natural stone surfaces that need to be polished, don’t take the risk of damaging them by attempting to polish them yourself. 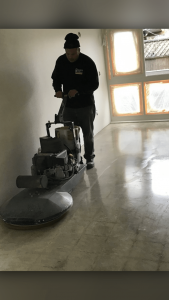 Contact Concrete & Marble Transformerz today to schedule a free estimate from our Top-Rated Local® restoration company!